Last year, we considered the importance of rites of passage in our lives and the way in which they align our whole being in accordance with Natural Law, thus enabling us to skilfully navigate our lives to maximum effect in each incarnation. 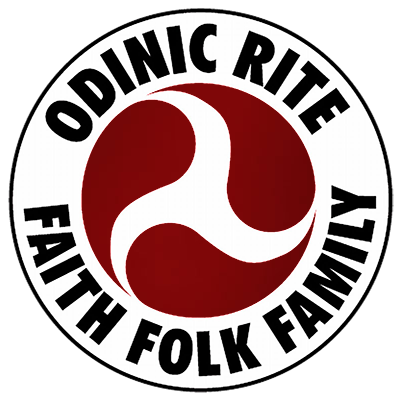 We addressed the fact that most folk today are raised without the benefit of these rites to guide them and how we, as Odinists, can work to rectify the problem by introducing rites into our children’s lives. However, in reality, this is a very complex reintegration process that poses a few problems. Firstly, we all live within the wider cultural milieu, which subscribes to the idea of life being subservient to the ‘Second Law of Thermodynamics:’ life inevitably degrades towards chaos and the static state of equilibrium. This belief fosters the illusion of life as being a linear process in which we are born, we live, we die; we have a separate past, present and future and aspects of our lives are perceived as being ‘good’ or ‘bad,’ ‘light’ or ‘dark,’ ‘right’ or ‘wrong,’ ‘success’ or ‘failure’ etc. Ideas of ‘perfect’ states are fostered and striven for: the ‘perfect house;’ the ‘perfect job;’ the ‘perfect partner;’ a ‘perfect god.’ Thus, the activities of modern life tend to be about the ‘flattening’ of cyclical events in an attempt to create this erroneous ego-defined illusion of perfect states. But as we all know, life isn’t static; rather, it is a vibrant interplay of paradox that seeks to explore the complex nature of the unification of apparent opposites. But these perceived opposites are facets of a wholeness from which they cannot be apart. It is only our limited perception and imagination within the realms of dualistic belief systems that cause us to perceive isolated fragments in life. Unfortunately, we cannot help but be poisoned at many levels by these illusions. They cleave parasitically to our very beings at birth within the predominantly Judaeo-Christian consumerist culture our parents inhabit and to whose beliefs they- consciously or otherwise- subscribe. As children, we learn as much from the subconsciously motivated actions of our parents as we do from their apparent behaviour; for example, a parent that grew up receiving only conditional love from his/her parents might vow to bear only unconditional love for their children; but having not received it themselves, they may well unconsciously turn love into a prize to be won for good behaviour via their discipline strategies. This outcome is endemic in wider culture and integral to the corporate world. More so than most, Odinists are realists and recognise such difficulties; but as we too are only human, extinguishing these dissonances within our psyche can be a lifelong challenge, during which time the future generation are raised. Another problem occurs in that there are some folk who will not bear children. Maybe they won’t meet a partner; they might not ‘be called’ to have children; they may be unable to bear them; their circumstances may be wrong: the reasons are many. Hence, these folk may feel working for the reinstitution of rites of passage is something they personally can have little impact on and that at best, it constitutes an interesting goal for those with children. So questions arise: how can we be sure we are on the right track when teaching children? What relevance does this work bear for those without children? At the core level, it must be realised by all Odinists that the reinstitution of these rites is integral to the greater complex of recovering the sacred cycles inherent within ourselves, our family, our folk and our mythology: it is absolutely crucial for the restoration of our glorious religion. No Odinist can be exempt from this holy task; for every individual is like a cell to the movement; just like those Russian dolls, each person is a fractal to the whole. And the implicit affects the explicit: every act of the individual creates a resonance within the greater whole that can either help or hinder the movement- even by virtue of their thoughts; for thoughts are energy and everything is energy. The effect of resonance upon our surroundings is scientific fact. In the 1960’s, the physicist Cleve Backster discovered that living cells ‘tune in’ and respond to emotions and intentions: white blood cells taken from a person’s mouth continue to respond electrochemically to the donor’s emotional states- even when that person is outside the state! Further, the biochemist Dr Candace Pert has stated: ‘In the end I find I can’t separate brain from body. Consciousness isn’t just in the head. Nor is it a question of mind over body. If one takes into account the DNA directing the dance of the peptides, (the) body’s the outward manifestation of the mind.’ Indeed, our body-mind is an ever-changing dynamic field of energy and not a static physical structure. It is a hologram in which every part contains information about the whole and vice versa. This is a very exciting state of affairs; for it means that we have the theoretical ability to revolutionise our health and behaviours at any given moment and to create an immediate effect upon our environment and ourselves. The only limits are our conscious and subconscious perceptions of that power- perceptions which reside in mind, viscera and cell alike. And with that potential power to effect such changes comes great responsibility, and the inherent hard work engendered by it. For it is imperative we learn to consider the effect upon the greater whole of every thought, word and deed- their resonance throughout the great web of Wyrd- which returns to affect our individual selves and folk at any moment within the great crucible of cyclical time. One way of approaching life empirically is to imagine how we would create a truly Odinic nation. Last year, Kathy spoke eloquently about folk building, so there is no need to reiterate what was not only said, but which is beautifully practised at hearth level. However, if we adopt the strategy of working with a vision of our world 10,000 years from now- or in seven generations time, as today’s Inka people do and which is the natural parameter by which to carve a life in the here and now- how would our nation be? Just how would we live our lives? Perhaps some central concerns would be the arenas of health, food, water, environment, energy sources and ritual. Whilst these all form part of the cohesive whole of any societal fabric, for the sake of convenience, let’s briefly consider these facets to illuminate our discussion. Health: Good health is a central prerequisite to a creative, fulfilling and useful life. Today, we are constantly told that people are living longer lives, as if that were the sole criteria by which quality living is judged. Yet, we witness evermore sickness at younger ages: heart disease, cancer, neurological problems; the list is endless. What is going on? After all, isn’t medical technology just wonderful these days? Operations are quicker and more accurate; scientists are discovering a gene for virtually every malady and hence we have a pill, vaccination or transplant for most health concerns – and additional ones invented by the medics! Never mind the fact that at least one in five operations result in iatrogenic- doctor-induced- illness resulting from ‘superbug’ infection or technical error! The central problem with using drugs and surgery is that this healthcare model usually deals with the end manifestation of a process, whose origin often begins long before the need for drugs or surgery is perceived. Starting in childhood, we continually push our bodies towards catastrophe, ignoring or suppressing acute disease: aspirin, paracetomol, painkillers and vaccinations become the norm. If the language of the disease had been heard at the right time, there would be little or no need for drugs- or surgery. For health is not a static state; it is a cyclical event in which our bodies regularly cleanse and regenerate themselves in order that we can function at a high level. Indeed, to never have a cold, (or to suffer too many: balance is the key), is unhealthy because it means the body isn’t cleansing itself properly and is in danger of driving the disease state deeper into the tissues; this may manifest later as something more serious, e.g. cancer. Likewise, medicating every pain or sniffle risks a similar outcome. Illness is a messenger asking us to slow down, rest and recuperate; it is that half of cyclical events we culturally flatten by ignorance and ‘shooting (i.e. medicating) the messenger’ in a vain attempt to maintain continuous productivity! But endless productivity is unnatural and unsustainable: it exhausts the system to the point of annihilation. Adrenal exhaustion is endemic in society: how many people are constantly tired but pumping themselves full of stimulants in an attempt to maintain a basically ‘souped up’ level of being? To create, we need to know how to cut. In fact our cells do not work on a linear timescale: whilst they have a limited number of lives, the time and quality of how they survive is environmentally determined. Even our DNA changes, alters and responds to physical, biological, mental, emotional, spiritual and psychic cues. It is not the static sequence of genes that classical science maintains it is. DNA’s quality of expression occurs as a result of beliefs and behaviours learned from our families and society: predisposition to illness is a consequence of repeating disharmonious behaviour down the generations until it apparently becomes an inherited characteristic. Obviously, this doesn’t deny the very real existence of physical genetically based illnesses or those resulting from environmental pollutants: but even these can be invited. Unskilful behaviour prepares a suitable soil for disease to take root. But no illness is ‘hardwired’ and many can be used as a ‘teacher’ for true healing that benefits not only ourselves, but our ancestors and successors also; for real healing occurs in the zone of timelessness where past, present and future as constructs do not exist. Thus, we do not have to be slaves to our apparent genetic heritage if the pattern hampers us: how many people find themselves repeating the same story as a relative- or experience several life events with a similar theme? These are personal mythological patterns with a lesson that may have been instigated by an ancestor or in a past incarnation; but the imprints they create in our light body (remember, our mind body is an energy field subject to morphic resonance across the generations), may keep us ‘stuck’ and unable to evolve, even when the lesson has been learnt; for they are like a deep wound that keeps reopening. Shamanic techniques exist to erase such imprints so that the lesson can be learned and we- and our successors- can finally move on. Most problems arise from the infection within our folk soul that spews from the Judaeo-Christian mindset and its resultant unbalanced living. As an extension of this, medicalisation alters and interferes with our life-path by messing with our vibratile frequency and homeostasis, encouraging addictive states and consequently, distorting our health cycles. Thus, the majority of the solution lies with reinstituting rhythm within our lives and recognising that our mind-body has daily, monthly and seasonal cycles. We have daily cycles of cleansing, absorption and assimilation; we have annual cycles of deep tissue cleansing (spring), high energetic levels (summer), strengthening (autumn) and conservation (winter). Meanwhile, our organs are associated with different planets and will be affected by their motion. Thus, we are at the centre of our own solar system and, like the orchestral conductor, we need to find ways of recognising and harmonising these cycles with those of our greater life cycles- without personally identifying with them. Food and water, environment and energy sources: I shall consider these areas together, since they are indivisible. Humanity is integral to the landscape; there is a reciprocal relationship between the land and us, so that whatever we do returns to us in some form. For the last 2000 years, wider culture has applied the reverse hypotheses and we are now paying the consequences: instead of using crop rotation, large scale profit-based monoculture has exhausted fertile land, creating dust bowls and unsustainable urban zoos in its wake. Water- the shared lifeblood of the land and all life- has been polluted by chemicals that erode the health of both. Folk communities that worked with sustainable diversity and the land’s cycles have been destroyed. As Odinists, we must try to restore that relationship by employing technologies based upon the life-enhancing principles of implosion rather than the prevailing explosive methods. Implosion is the suctional, centripetal, frictionless, spiralling, creative, cooling motion that moves matter inwards towards order; explosion is the reverse process, which Nature employs to decompose matter. Is there any wonder culture is in chaos? We resonate what we work with! Implosive technologies that work with free etheric energy from the Earth’s natural magnetic field and which could make us self-sufficient with clean, free energy have been available since the 1900s! But vested interests of the petrochemical industry have ensured the discoveries have gone unused. Similarly, water should raise our energy levels by supplying us with life-giving angstrom energy; unfortunately, sending it through straight pipes and poisoning it with chemicals and their imprints means that it becomes harmful to life. As discussed in a previous article, water mediates our lives at every level and resonates our input back to us: we must treat it in accordance with Natural Law. So too with land use: by employing permaculture principles as a fundamental model for farming, forestry, town planning, financial and social structures and forest gardening techniques in our own gardens, Odinists could create very productive, inexpensive, none-polluting communities that work precisely because they integrate with natural ecosystems and their cycles. We are also wise enough to recognise the importance of working with the ‘spirit of place’ or landwights; again, there are places and ways to build and places that should just be left because the energies are plain wrong. I believe we ignore this at our peril: ‘sick building syndrome’ has as much to do with disharmonious alignments as it does electromagnetic and chemical pollution; our ancestors understood this and we must recover that knowledge to reinforce our efforts to live the cyclical. Even the materials we use must be carefully chosen: copper, wooden and bronze tools yield healthier crops, larger quantities with fewer pests than iron ones because metals affect the electromagnetic qualities of the soil. No wonder the fairies reputedly fear iron! Ultimately, everything we work with and do at every level affects our evolution: remember, experience is all. Hence, we must strive to live as though life is a sacred ritual. One important point I’d like to raise relative to ritual is this: if you think reinstituting the cyclical life is all sweetness- ‘a piece of cake’- then I challenge everyone to deeply consider their attitude to humanity’s template for the sacred- the female menstrual cycle. The word ‘ritual’ arises from the Sanskrit ‘ritu’ meaning blood and I would hypothesise that our word ‘Blot’ bears some relationship to the German for blood- ‘Blut.’ The word ‘menstrual’ derives from the words moon and measure- and by extension, time. Indeed, in times past, the cycle was recognised as being at the centre of community rhythm: women in regular contact will often have synchronised cycles. At the heart of the cycle are regular changes in consciousness- natural liminal states- that give rise to differing levels of creativity and if followed, are life-enhancing. Meanwhile, a man’s monthly creative cycle is much shallower, but will mirror the cycle of any woman in his life. Unfortunately, to the Judaeo-Christian, this subject is the ultimate taboo and we are suffering from it as much today as during the medieval witch-hunts. Essentially, the values assigned to premenstrual and menstruating women do not ‘sit pretty’ in the collective consciousness of consensus reality: they are no longer seen as the compliant, fertile, productive, nurturing, sexually available, motherly creatures of the ovulatory half of the cycle who ‘fit in’ with everyone else; they are very likely to be perceived as unsociable, destructive fiends to be avoided. So-called PMS is the culturally induced ‘flip-side’ shadow experience of a natural psychic state that feels personal, cultural and ancestral misnomers at a visceral level. There is ego dissolution and then rebirth at menstruation into a new cycle of experience as the kundalini energy rises through the chakras. The Oracle of Delphi were actually menstruating women. The manifest experience for many women is genuine physical pain and disturbing symptoms from the rejection and influence of pollutants: pollution results from actions generated by the trance of distorted linear perception. Culturally, menstrual experience is silenced by medication, ridicule and Judaeo-Christian guilt-trips. This is obviously a huge subject area and there is no scope to elaborate, suffice it to say I believe it partly answers the question as to why attracting women to Odinism has proved difficult so far. My hypothesis is this: much of New Age spirituality- and even general paganism- panders in some degree to the feminist movement, with its perverting ‘men versus women’ attitudes. Thus, subscribing to such paths, which support a linear, dichotomous mode of being appears more comfortable. Indeed, many so-called spiritual practises work against women’s bodies; yet it is still mainly women who attend the conferences! Meanwhile, very little has been written about our Goddesses, whilst much more appears about our Gods, making Odinism an apparently male-dominated religion. However, my suggestion is that much about our Goddesses is the return to the innate feminine- cyclical- body-conscious forces that plumb the peaks and troughs of ecstatic experience and are often impossible to adequately describe. Perhaps there never were many original writings because much about the Goddesses concerns the crucible of our soul parts,- which are incompatible with consensus values. Even Odin needed Freya’s skills as shamaness, demonstrating the inherently beautiful balance in Odinism. Perhaps much of our challenge in reinstituting the sacred is to rediscover the goddesses’ gifts and to attempt to write about them in a way that provides a folk map; but writings can never be their territory. Once, in meditation, I received a distinct image of my ancestors as being a vital artery to the land aswell as myself; modern life attempts to cauterise this folk knowledge. But we can regularly re-stir this timeless knowing back into being using our holy firewhisk- the fylfot. I believe this symbol mirrors the implosive vortex motion of galaxies and Nature, spiralling in all directions simultaneously and spinning off the dross. In so doing, it resonates the cyclical through our being and regenerates our spirit and soul-parts. The new awakening is a constantly unfolding process that falls nothing short of revisioning our entire lives and making quantum leaps into the abyss of the apparently unknown in pursuit of that vision. As correctly stated countless times, Odinists are revolutionaries: we need to be activists in every life area if we are to survive and reset our coordinates back on track towards the new Golden Age. Much like the athlete who breaks a new world record, the first to do so has the most difficult job because consensus belief doubts the possibility and these forces work against him. However, once done, it is as though a new track has been forged through the psychic undergrowth and the task for many others is thus eased. And so it is for pioneering Odinists. We also have to advance with a huge smattering of faith: in our present state, the knowledge and vision our ancestors must have had during the Golden Ages is virtually unimaginable, such would be their majesty- and such is our present limited perception by virtue of the collective conscious beliefs and the grosser age we live in. Can the caterpillar know what its life and vision will be like when it transforms itself into a butterfly? Does it even know that is where it’s headed? In all likelihood not; but its instincts ensure it eats well and knows when to spin a cocoon to cradle the crucial transformation. Similarly, living the sacred cyclical is inherent in our very blood: blood moves in spirals. Such vital instinct necessarily harmonises our frequency to accord with the greater cycles of time, ensuring that our evolutionary path reintegrates back into their flow. Then we will be lifted by the natural vortex thus created into the realms we know are home: the Odin consciousness and a new Golden Age.